Is the tail end of your season tight enough? Fear not. Gronk (maybe, please, PLEASE! ), Greg, "Big Play" Barnidge, and ... Zach Miller? ... yes, they're all here for you. Week 13 is here, and whether you're right in the playoff mix or simply playing for pride (that would be me), nothing can loosen the pressure (or lack thereof) like a tight end that delivers. Playing the streaming game? On injury alert? Don't fret; we've got you covered with our week 13 tight end rankings. 1. Greg Olsen @ NO- It's always 1A and 1B with Greg and Gronk. Greg plays the Saints. If your grandmother's best friend down at the local Bingo was playing the Saints, she'd probably at least be in the top-10. 2. Rob Gronkowski* vs PHI- Gronk gets the slightly more talented/competent Eagles in week 13. As of now, he is looking very doubtful for week 13. Some media outlets suggest he has an outside chance of playing, but scooping up Scoot Chandler would probably be a wise move for Gronk owners. 3. Travis Kelce @ OAK- Despite a pedestrian output between weeks 10-11, Kelce has established himself as a top-5 weekly play. The Raiders have been known to see opposing tight ends shine, so that further boosts Kelce's week 13 upside. 4. Jordan Reed vs DAL- This beast gets a delectable week 13 matchup against Dallas. He's averaged a solid 7 targets per game since Washington's bye, and is a touchdown waiting to happen in the red area. 5. Gary Barnidge vs CIN- Barnidge could not care less who is under center for Cleveland (McCown, Manziel, Davis, Kelly Holcombe, Spurgeon Wynn, any of Cleveland's other 6,092 quarterbacks since the reincarnation of the Browns' franchise) as he showed in week 12 with a sturdy 7/91 line on 11 targets. 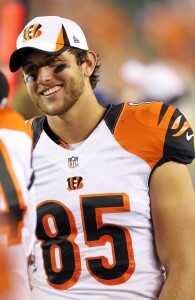 Tyler Eifert (see below) may not play, which means Barnidge may be the best tight end on the field in week 13. 6. Tyler Eifert* @ CLE- Iffy with a neck injury, but was well on his way to a nice day in week 12 before going down. If he plays, the NFL's leader in touchdown receptions is a must-start. 7. Antonio Gates vs DEN-2 big touchdowns in week 12. Gates is still a playmaker, and still one of Philip Rivers' favorite targets in San Diego's pass-happy offense. 8. Delanie Walker vs JAX- One of this year's most overlooked and underrated weapons, Walker continues to produce and will get a Jags defense that saw Antonio Gates make them pay the price in the red-zone. 9. Julius Thomas @ TEN- Thomas looked like his old self in week 12 with a 9/116/1 line. Tennessee has given up the 10th-most fantasy points to tight ends in 2015, making this a good matchup for JT. 10. Benjamin Watson vs CAR- Expect Drew Brees to have to settle for many a checkdown against a very good Panthers defense. Watson offers safe hands an a knack for getting open underneath. Tyler Eifert says he should be able to play in week 13. 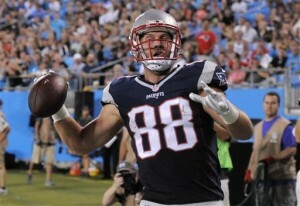 Keep an eye on Scott Chandler if Rob Gronkowski (knee) can not play in week 13. Cameron Brate vs ATL- If Austin Seferian-Jenkins continues to play with our emotions and misses ANOTHER game, Brate is a name to monitor as a dart throw. Luke Willson @ MIN- Jimmy Graham is out for the year, so you know what that means. Should be a very popular waiver wire add, and his pre-existing chemistry with Russell Wilson can not be underestimated. Scott Chandler vs PHI- If Gronk doesn't play, Chandler becomes very relevant. Saw 11 targets and scored in week 12. Will Tye vs NYJ- Emerged as a weapon for Eli Manning. Not flashy, but can catch the ball and serve as a security blanket, a role which is quite important in Ben McAdoo's offense. Jesse James vs IND- If Heath Miller (ribs) can not go, James becomes relevant. He has flashed some red-zone chops and cuts the figure of your prototypical Steelers tight end.